Powerful filters is an add-on for wpDataTables which allows you and your site visitors to filter table data in the WordPress Tables frontend with Cascade filters; it also allows you to hide the table before the filter is applied. Cascade filtering enables narrowing down the number of options available in each next filter by selecting from a previous one. For example, if in the first filter you have a list of continents, in second a list of countries, and in third a list of cities, when you choose a continent, the next 2 filters will only show the countries and cities that belong to this continent. Cascading filters are very useful for large datasets, since finding data becomes much faster and more convenient when the filtering options are narrowed down “on the fly”. 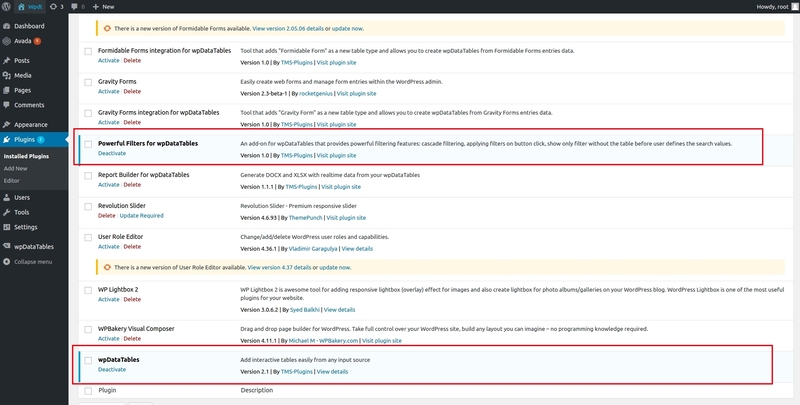 Go to your WordPress admin panel, open the “Plugins” page, then click “Add new”, there choose “upload” and then browse to the ZIP file that you’ve downloaded from CodeCanyon. Extract the ZIP file that you’ve downloaded from CodeCanyon, open your WordPress installation through FTP, browse to wp-content/plugins, and upload the extracted folder there. Once you’ve uploaded the plugin using either of these 2 scenarios, you should see the Powerful Filters addon in your plugins list. Just click “activate”, and you’re good to go! Please note that you need the wpDataTables 2.1 full version to run the addon! It will not work with earlier versions of the plugin, or with wpDataTables Lite. After activating the Powerful filters addon you will notice several new options in the Sorting and Filtering tab on the table configuration page. To try how the cascade works, enable the “Cascade filtering” option and choose either of two available logic types: “From left to right” (dependent filtering), and “Free” (independent filtering). In an example above you will see filters in a table, but if you want to see your filters in a form above the table you can enable option “Filters in a form” (click here to read more about Advanced Filtering features in core wpDataTables). If your table has the option “Filters in a form” enabled, and the filter is rendered outside of the table, Powerful Filters addon will add two new options to the filtering tab: “Hide Table” and “Search button”. “Hide Table” – this option allows you to hide the table content before some selection is made in the filters. It is a great feature if, for example, you only want to show users data in the table that is based on an input of a particular filter (e.g. only a specific type number, or a single category), without distracting them by showing full table content all the time. Search button will allow you to add or remove the search button. By default, wpDataTables data is filtered automatically when any filter has been changed; and the Search button is enabled. Filtering won’t be applied “on the fly” – the table will only be filtered when you click the Search button next to the filters. Once you enable the Search button, you will see one more option – Disable search button. Enabling this option will keep the search button disabled until a user selects options in all available filters. This is useful when you only need to show users a particular row. In this way, you restrict users from applying broader filters. The wpDataTables core plugin also provides a comprehensive list of filter types: text, number, number range, date range, datetime range, time range, selectbox, multiselectbox and checkbox. Combinations of these filters, along with the Powerful Filters functionalities, provides real flexibility for configuring the filtering engine for almost any project. You can read more about the Advanced Filtering functionalities here.